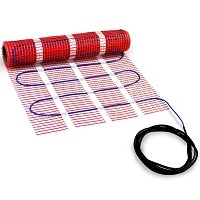 240V mats from HeatTech are best compatible with flooring which has high thermal conductivity (absorbs and transfers heat well). Among such are natural stone - granite, marble, slate, travertine and others as well as ceramic and porcelain tile. This type of flooring also offers better structural stability of the system and protects the cable better from accidental damage.